Thursday, November 30, 2017: Hard to believe that this marks the beginning of our tenth consecutive Excellent Adventure to the American Southwest! Also, hard to believe that Kit has put up with my convoluted style of travel…thanks dear, I Love You! We departed at 0410, under a crisp clear sky and a temperature of 26 degrees. Kit isn’t a fan of leaving so early, but I like to sail through the potential traffic trouble spots during the off hours and rapidly head south as far as possible before pulling the winterized camper into a motel parking lot and getting a room for the evening. In addition, being a morning person, I’m much more alert in the early hours of the day, and therefore a safer driver. 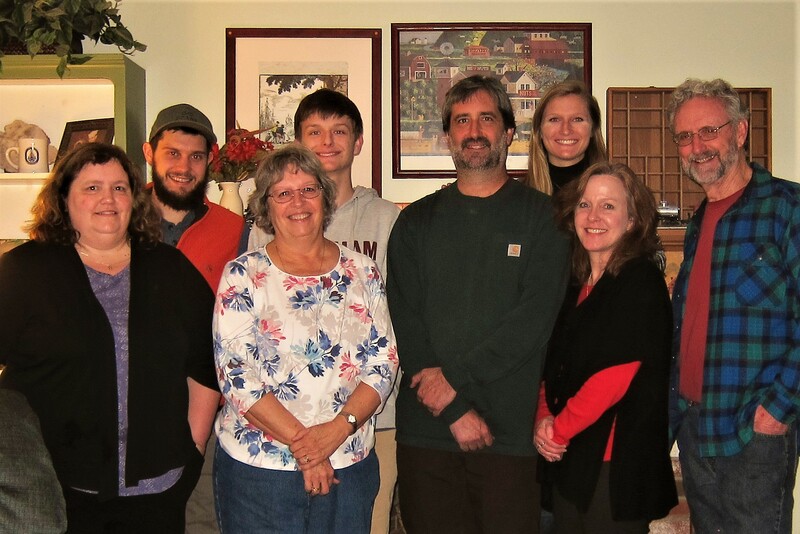 As in the recent past, we celebrated “Thanksmas” last week and the entire right coast family gathered for the festivities. 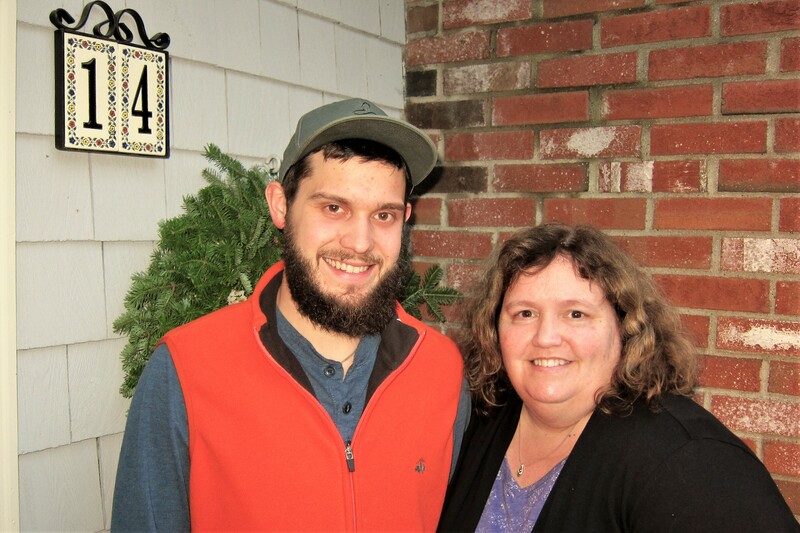 Our oldest daughter, Kim who will be watching over the homestead for us was joined by her 25-year-old son, Joe. And son Joe the Elder, traveled over the hill and through the woods with his family: Ann, Chris age 18, and Katie age 22. 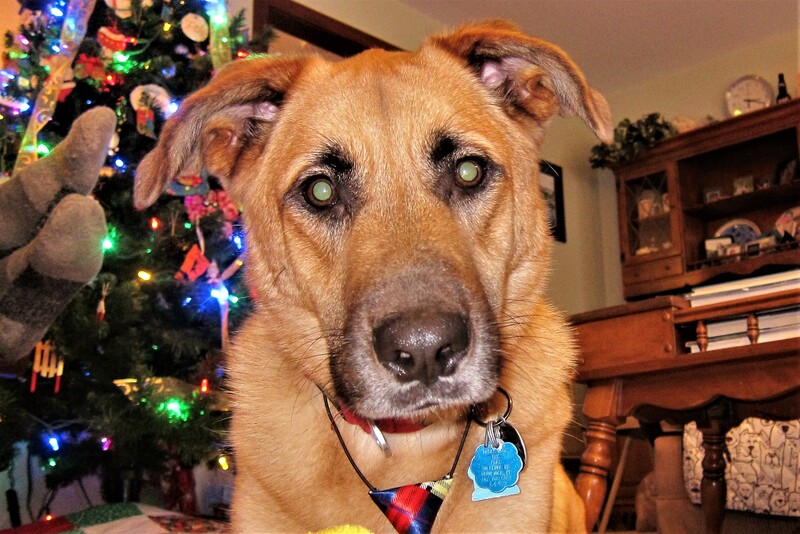 Then last but certainly not least was our great grand-dog Finny! Who hung out with Kit and I for most of the summer as grandson Joe was unable to keep him up on the Penobscot river where he works. Finny was a constant source of companionship and helped us keep in shape by routinely wanting to go on walks about our little town. 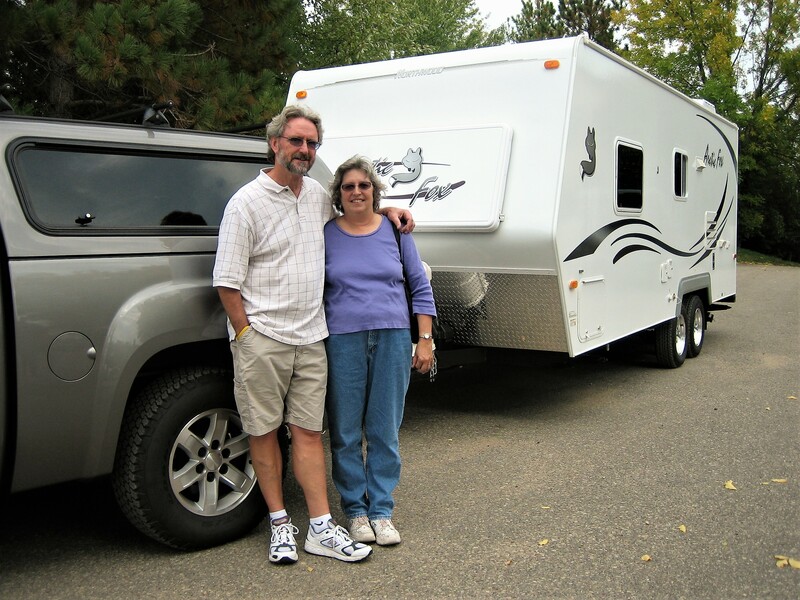 As mentioned, this trip marks our 10th annual RV adventure to warmers climes…who would have thought that two runaway kids would still be enthusiastic about seeking out the weird and wonderful along the backroads of our great nation? 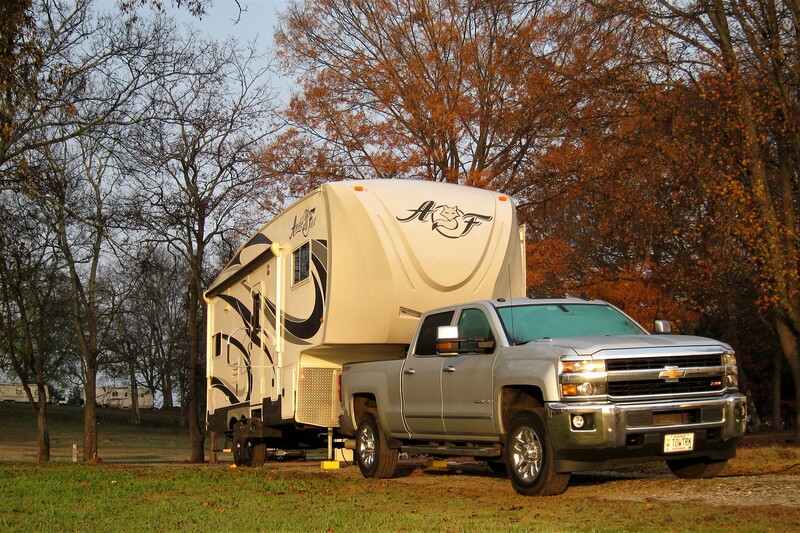 It all started in the fall of 2008, when the clueless adventurers set out in a brand new truck to pick up a brand new camper in Minnesota. 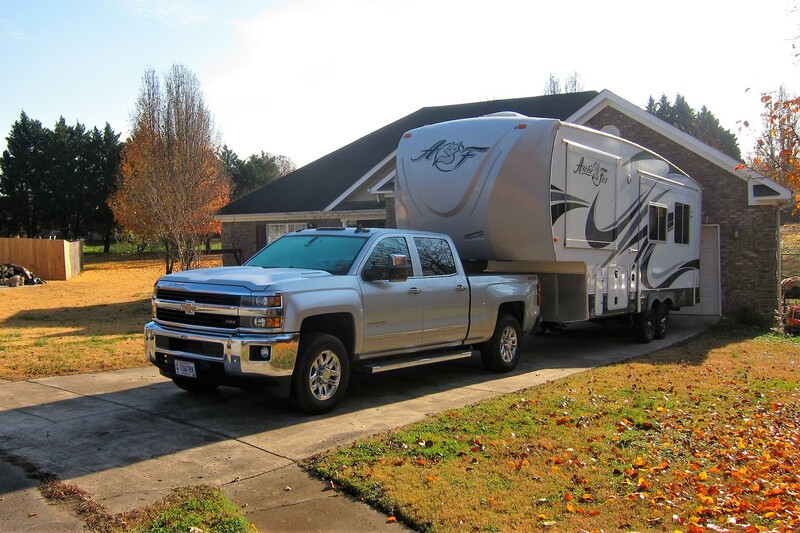 Fast forward ten years, and you’ll find the truck and trailer are different, as are we! But what hasn’t changed is our love of the RV lifestyle, especially when it’s cold and snowy in our adopted Maine hometown. Kit and I agree we will continue these annual winter trips for years to come if our interest, health and finances hold up. Notice the days on the road vs miles driven per day…back in 2009 we averaged 107 miles/day and last year it was down to 77 miles/day. Yep, with some spousal “counseling” I’ve learned to slow down and smell the Rosé! 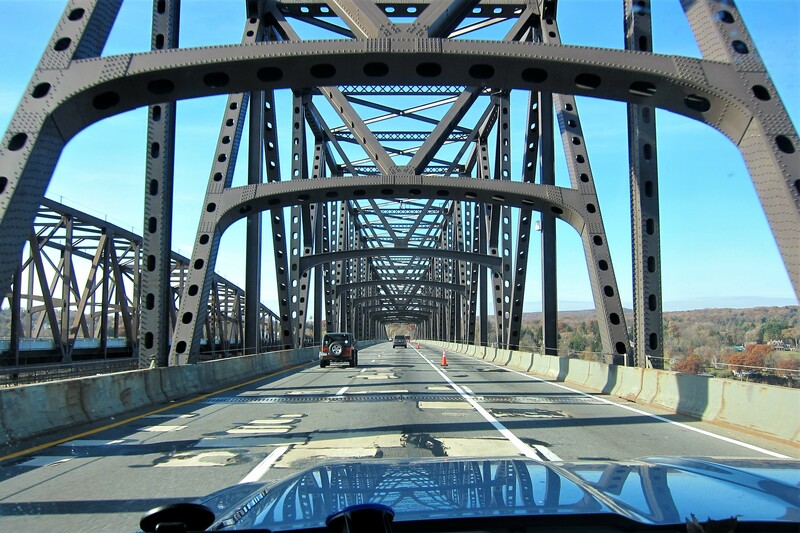 …and the long, rather boring slog through the Northeast corridor. As many travelers do, we use a GPS to navigate toward our destination, and it works very well…if you’re paying attention to it. If not, one could be barreling toward downtown New York City…yikes! Fortunately, Kit likes to track our progress with a good old-fashioned paper map, and has occasionally saved our bacon by questioning where I thought I was going! In this case, she alerted me to my mistake before too many miles in the wrong direction had amassed. Thanks, good catch Kit! 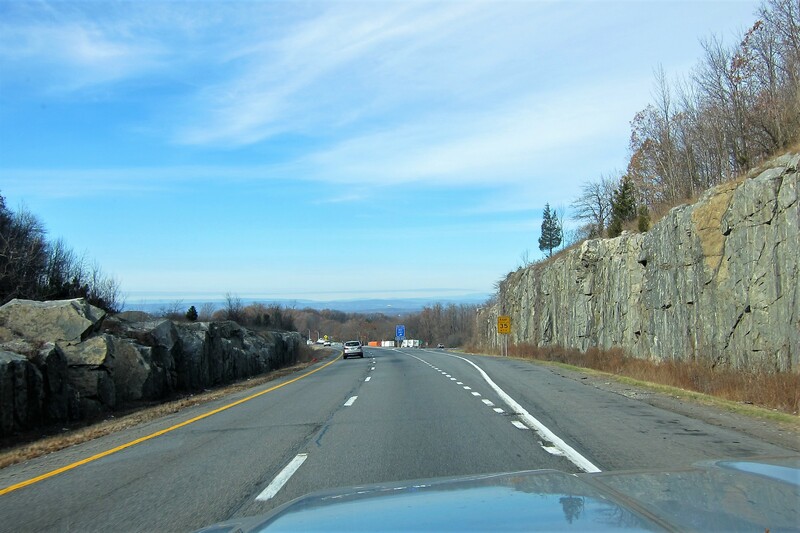 Back on the correct track, and shortly before noon, we crossed the Hudson River at Newberg, NY…our preferred route south to steer clear of the City with the Large Apples. 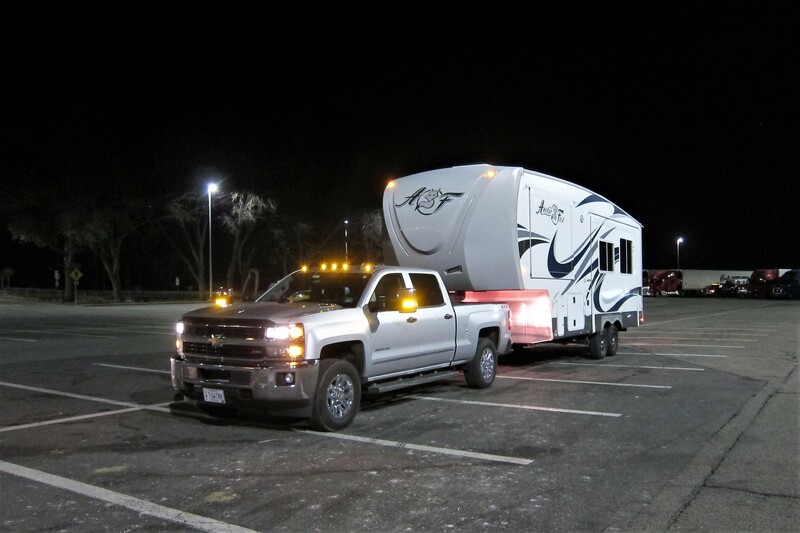 Because, dragging a 30-foot camper through any congested area is a bit more of an adventure than we would like. … a common phenomenon this time of the year, we had blown past 500 miles of travel, and decided to pull in for the evening. 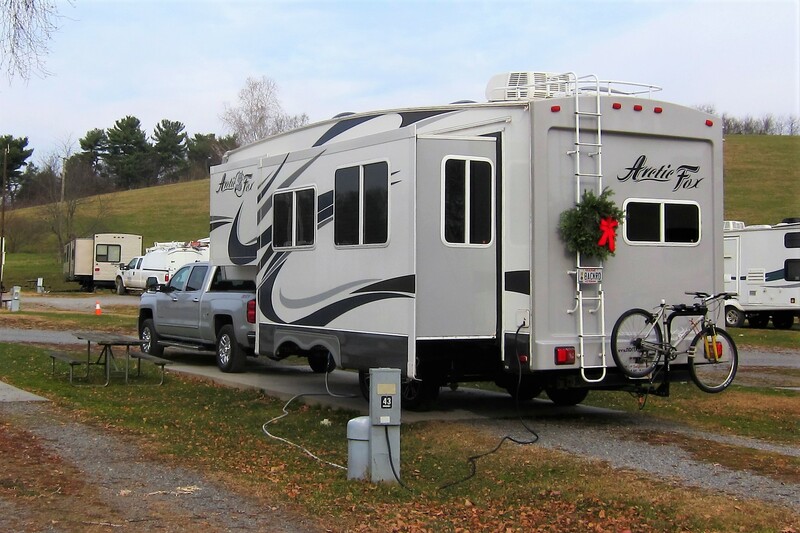 Kit located a campground that was open, so we headed to Western Village RV Park in the town of Carlisle, Pennsylvania for the evening. Friday, December 1, 2017: Woke to sunshine and temperatures in the low 50’s following a very restful night. Didn’t get to see much of our surroundings last night as we pulled in under the cover of darkness, but the morning revealed a very nice rural campground! Over breakfast, Kit and I discussed yesterday’s travels, and I think she has finally convinced me that leaving so early, and logging so many miles on the first day had outlived its usefulness…especially now that we leave in late November when the weather isn’t as severe, and we can start camping from the outset. Broke camp and departed the grounds at 1045 heading south on I-81, The Trucker’s Highway…the main route to reach warmer temperatures at a rapid rate. As you may remember, Kit and I like to travel more leisurely. Frequently, on a so called “travel day” only making a few hundred miles a day, however since we want to spend Christmas with or Vegas grandchildren, and their parents, we must step it up a bit. 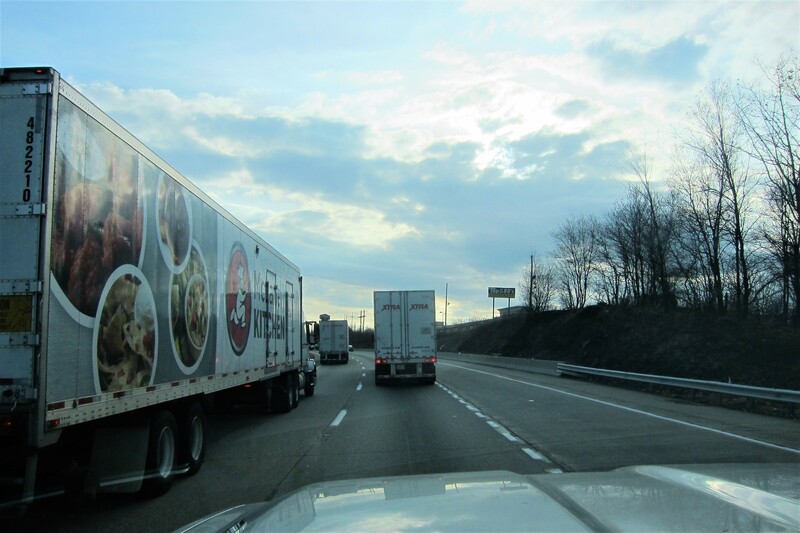 And for all its bad press, I-81 isn’t that bad…true there are tons (pun intended) of long-haul trucks, but we always feel safer in the presence of professional drivers, just give them some courtesy and they will reciprocate. Cruising south, listening to NPR and stopping every two hours for some walking around time, we made some great miles considering our relatively late start. But as the sun was dropping, we headed for a place to camp. Pulling into a Virginia campground that was recommended by fellow RV’rs, Ray and Darlene we chose a site for the evening, whipped up some diner, enjoyed a glass of wine and called it a night, which wasn’t a hard decision because it was dark outside. Saturday, December 2, 2017: Up and visited the Fort Chiswell RV Park office to pay for the stay and walk about the park a bit. 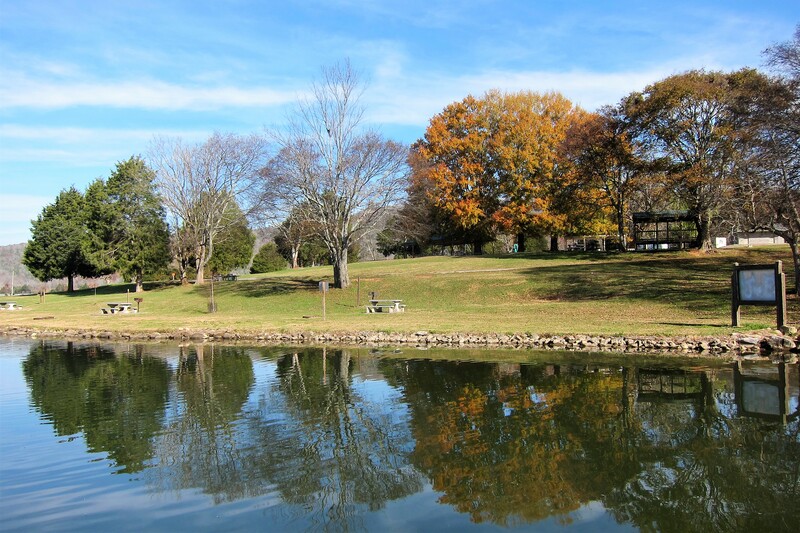 It’s relatively inexpensive, clean, quiet, and spacious…a great overnight camping opportunity located in the Virginia village of Max Meadows. Following a hearty breakfast of oatmeal, raisins, and walnuts, we hit the road at 1030 under sunny skies and temperatures in the mid 50’s. Today marks grandson Jack’s 13th birthday, so Kit and I woke him with a phone call and then treated him to our singing in two-part disharmony. 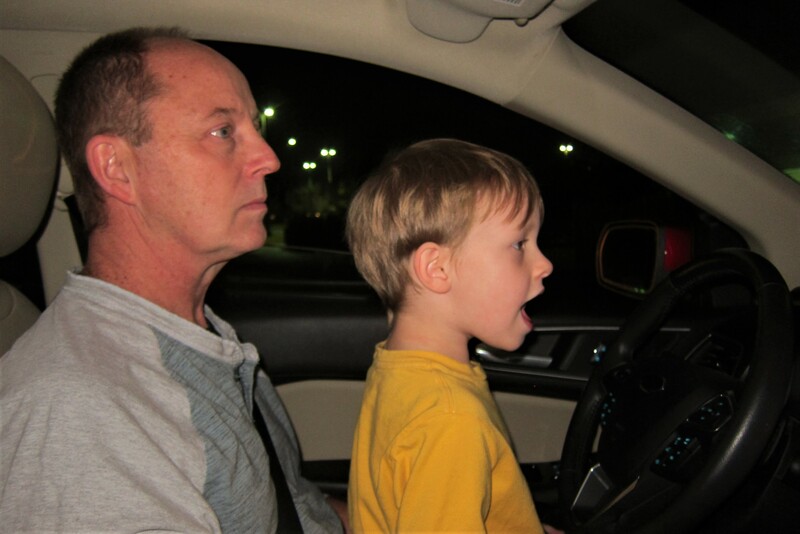 This has become a family tradition, and all five grandkids willingly endure our musical effort during their day of birth celebration…even the three adult grandkids, although it has become hard to sing above the audible groans! 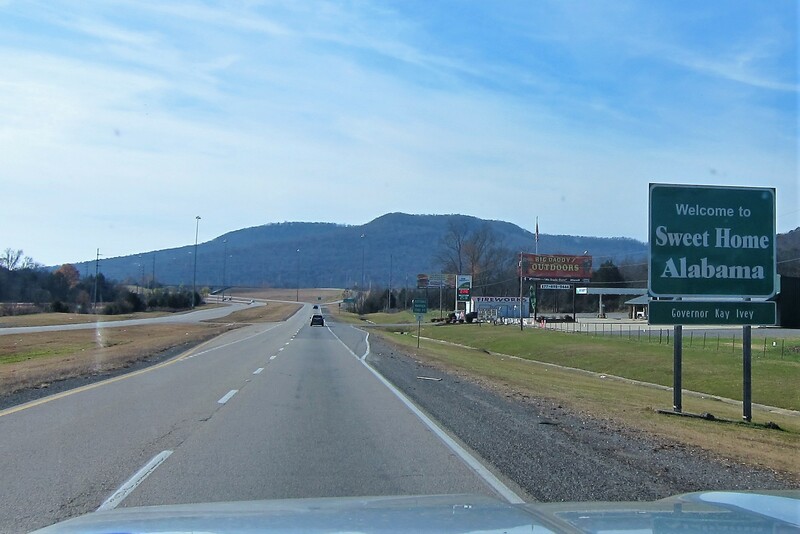 By noon we were rolling across the northern Tennessee border then veered off onto I-40 West toward Knoxville, at which point we headed south once again on I-75 toward Chattanooga. 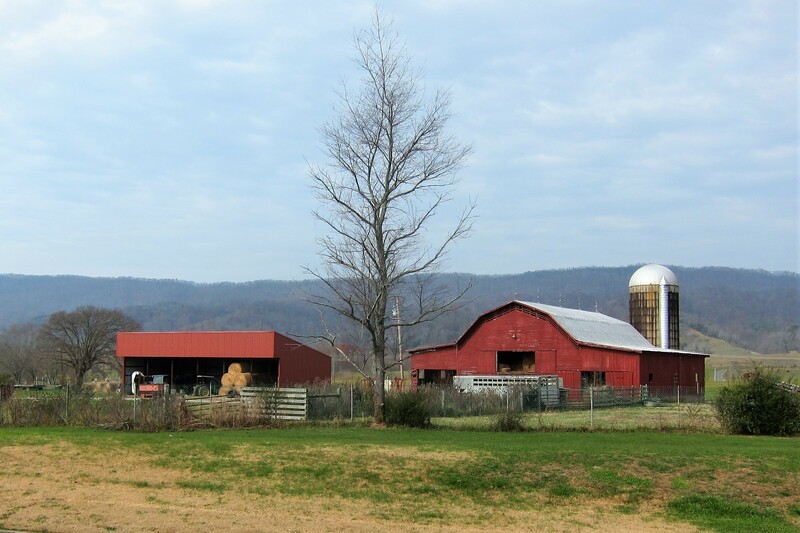 For the most part, this area of the country is rural and dotted with many small pastoral farmsteads. At 1643 we clipped a corner of Georgia before rolling back across the Tennessee line and encountering the Central Time Zone. An hour later Kit noticed a campground on a lake off in the distance, and since it was time for fuel and to settle down for the evening, we pulled into a Flying J Truck Stop. Inquiring within Kit discovered the campground was a county park, a favorite style of ours. So, after topping off our tanks, that’s where we headed, checked in, and set up for the evening. 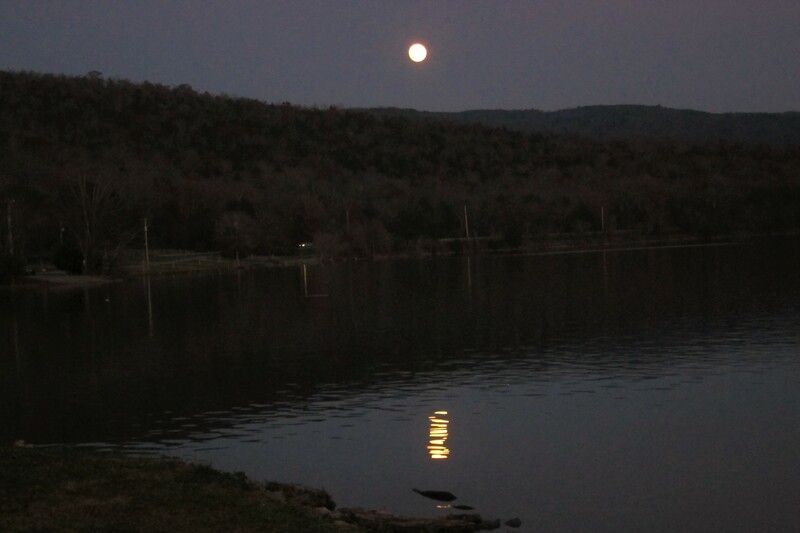 Following a nice meal, and a few cocktails, we spent the early evening watching the moonrise over the lake. Before calling it for the evening…goodnight! Sunday, December 3, 2017: Woke at 0630 to fog and warm temperatures. Using our camp percolator, I brewed some coffee, I grabbed a mug, and walked down to the lakeshore to greet the rising sun. It’s easy to nab an acceptable photo when the sun is low on the horizon and positioned over water…and this morning was no exception. Notice the bass boat that was speeding out from cove to grab some fresh fish for dinner. Kit and I really enjoy staying at these noncommercial campgrounds, whether they are National Parks, municipal campgrounds, Corp of Engineer parks, state parks, National Forest, or as in this case a county facility. Marion County Park features electricity and water at each site and a conveniently located grey water and black water dump station. 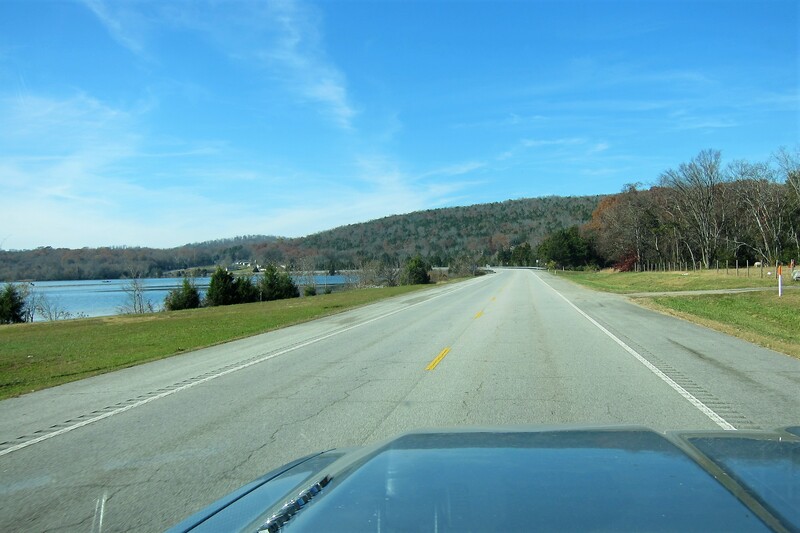 Sited on a premier bass fishing impoundment called Nickajack Lake, it hosts a number of campers during the warmer months, but at this time of the year the park was sparsely populated…even on this beautiful weekend! 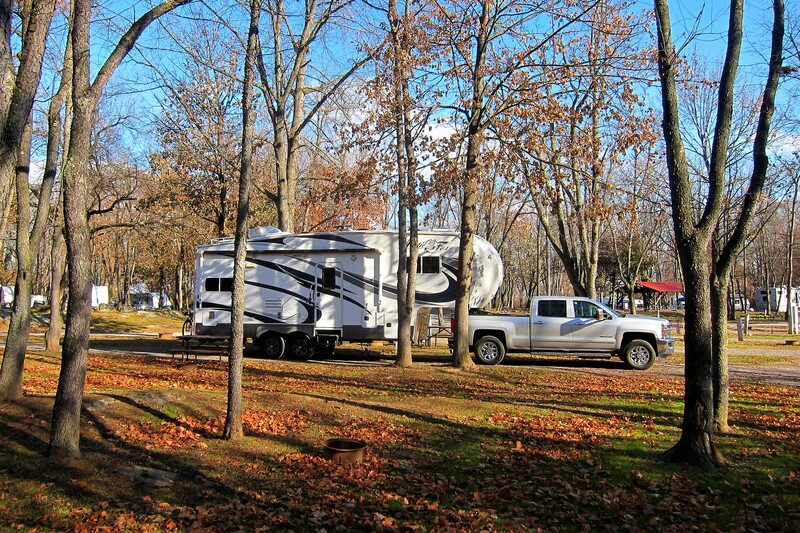 Kit and I agree that Marion County Park is within our list of the Top-50 Campgrounds that we have experienced, and we will likely enjoy this nice facility on future RV trips! 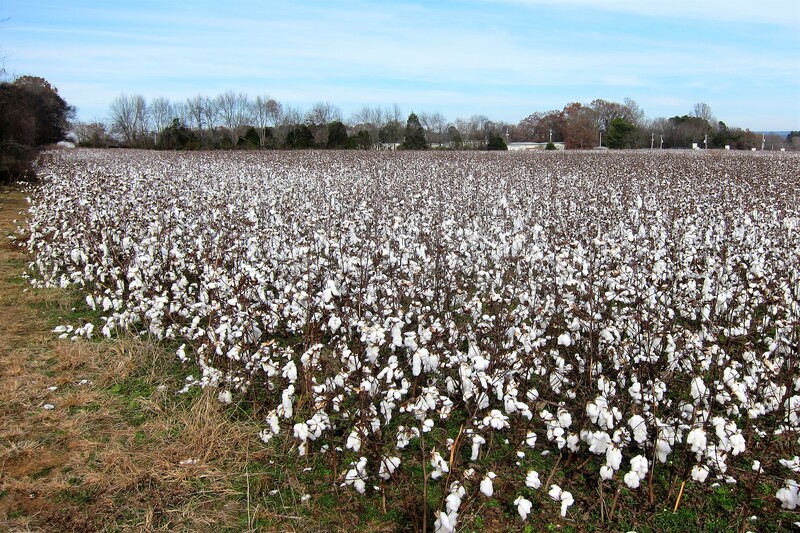 …the home of Judge Roy Moore, and vast fields of cotton…both of which have a significant impact on our nation at this point in history as they are omnipresent white and fluffy products of the region…but only cotton is commercially viable. Cotton comes of age ensconced in a “boll” until it’s mature when the boll bursts open, the cotton dries in the sun, and is ready for picking. Cotton fabrics have been dated to 4800BC making it the oldest textile known to man. Cotton production was a labor-intensive task until the advent of Cotton Gin, which when consumed, made the task less arduous. Historically the mature crop was hand-picked, and the average field hand could gather about 200 pounds a day. Then in the 1950’s mechanized cultivators were developed that could pick that same 200 pounds in approximately 90 seconds! 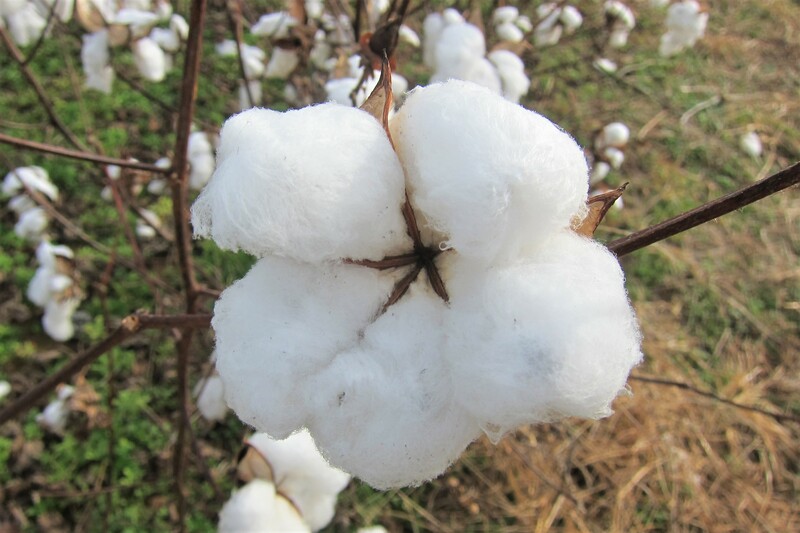 Raw cotton is not absorbent, but coated with natural oils to prevent rot while maturing in the boll…manufacturing removes these oils to render the fabric breathable. In cotton farming, nothing goes to waste, the seeds are pressed into oils and the remaining plant material is tilled back into the soil…truly an incredible crop. Oh, and the Cotton Gin is actually a factory machine what separates the desired fiber strands from the seeds and other items, thereby saving a considerable amount of manual labor in hand separating the raw cotton. 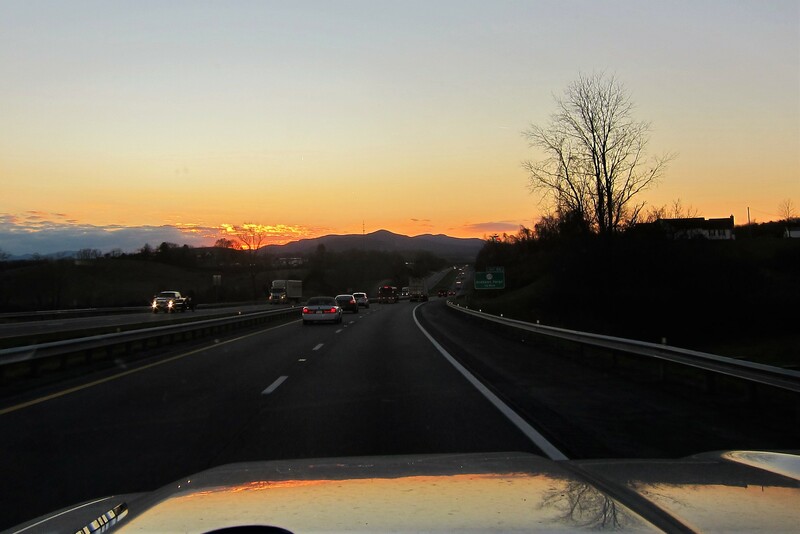 Being close to Huntsville, Kit and I decided to head west for a short detour of our southerly migration to visit a friend from our Vermont days. 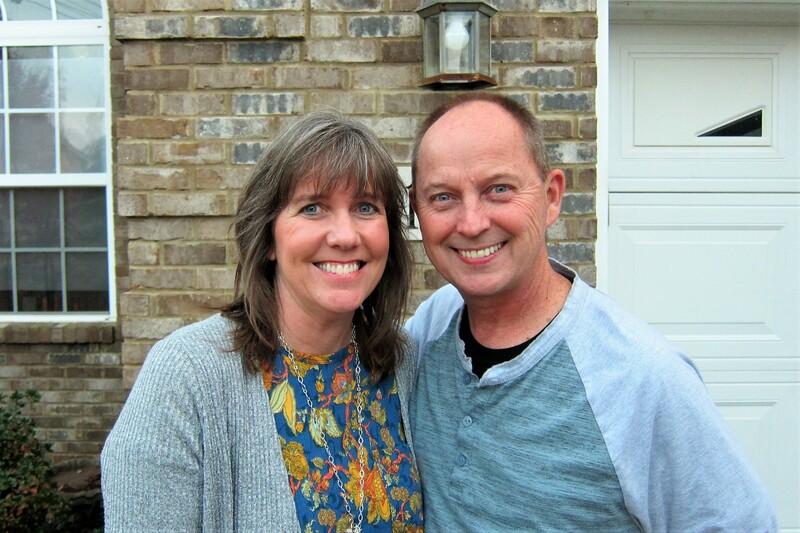 Debbie and her husband, Sam live in Meridianville, Alabama. 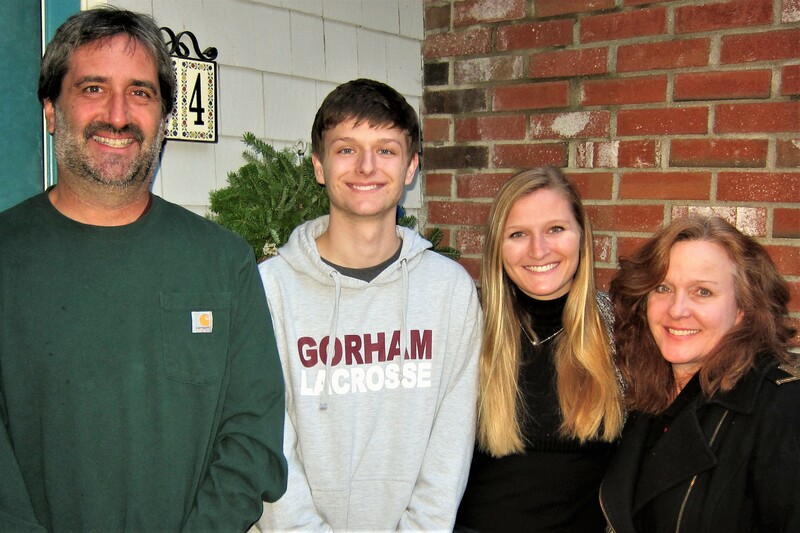 A childhood friend of our son Joe, and the best friend of his wife Ann, Debbie was a welcome and enjoyable presence in our home during their high school years. 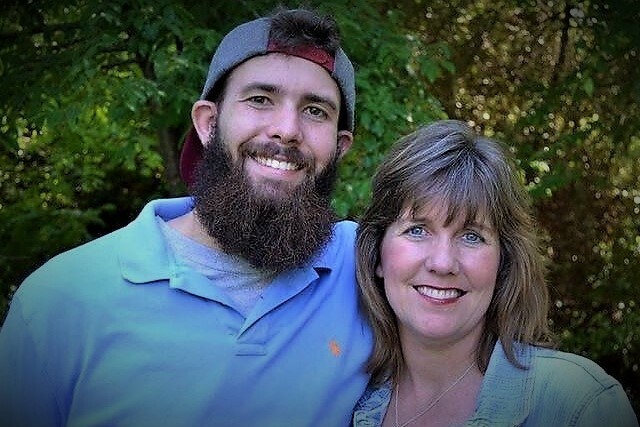 About two months ago, Debbie suffered a terrible and life changing loss when her oldest son Justin was killed in an auto accident. Although Kit nor I had the privilege of meeting Justin, he was reported to have been a kind, caring, thoughtful and hardworking young man. His loss has devastated the family and their grief was still noticeably raw. We were pleased to be able to provide a small amount of comfort and support during our all too short visit. Rest in Eternal Peace with the Lord, Justin. Sam was kind enough to clear the driveway to accommodate our rig for the evening. 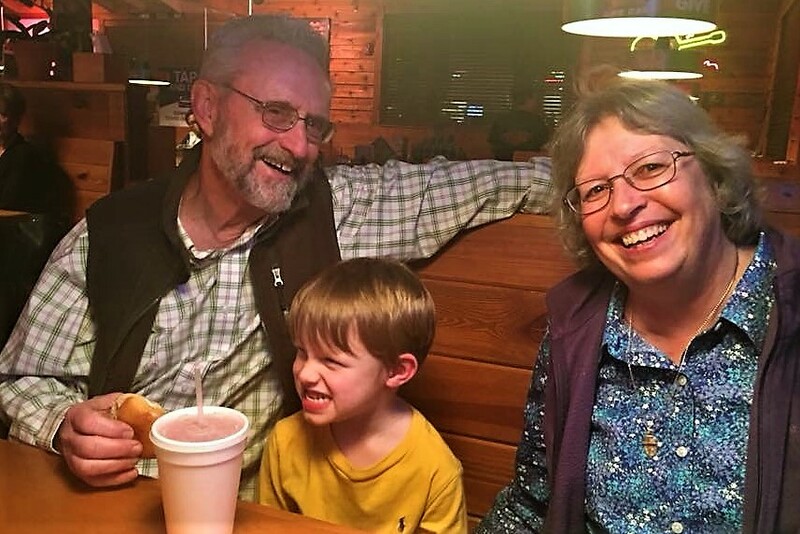 And as a thank you, we treated them, along with grandson Brantley to a meal at one of their favorite restaurants. 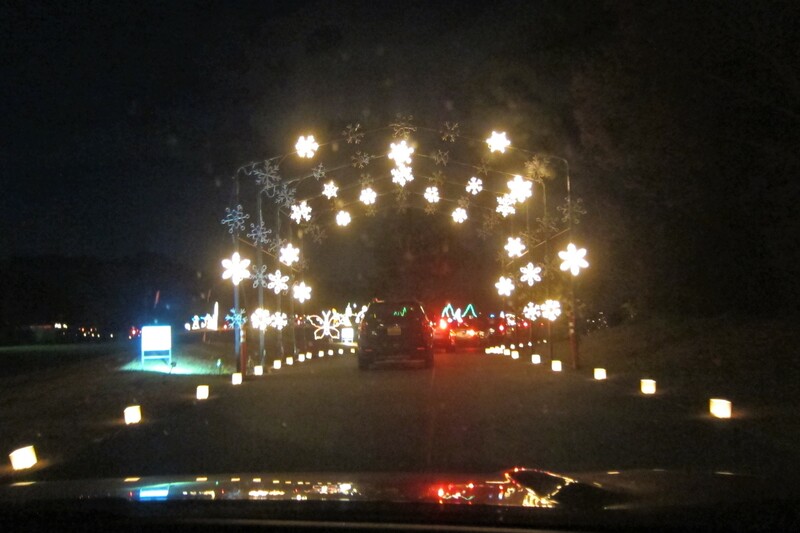 Which was followed by a drive out to the local botanical garden where a Christmas light show was on display. Different from the Gardens Aglow at the Coastal Maine Botanical Gardens back home, this vast display is a drive through event. 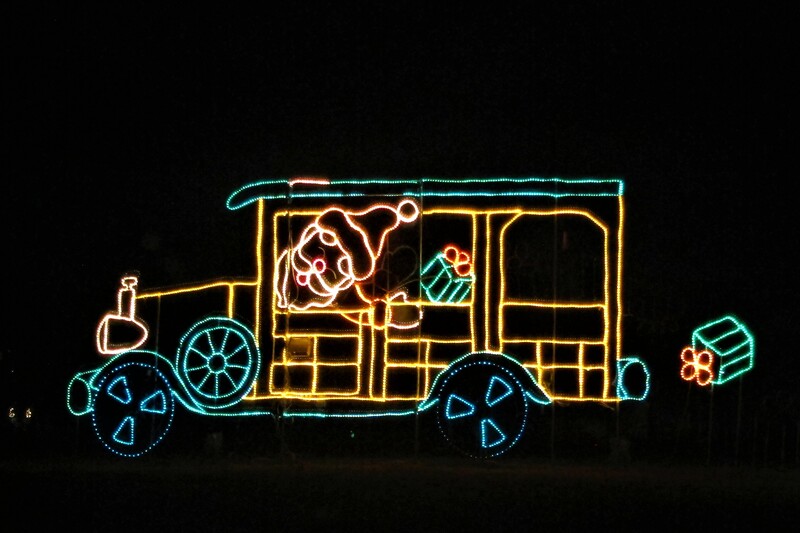 Dozens of static and animated light displays are sponsored by local business and the proceeds from the event go toward charity. The chauffeur for our driving tour through this festival of holiday cheer was 5-year-old Brantley. Under the supervision of Papa Sam. Returning to their home, we enjoyed some coffee and conversation before turning in for the evening. Brantley was interested in camping out with us in the driveway, so we made accommodations for him on one of the recliners. Aw, the restful slumber of a five-year-old…good night! Monday, December 4, 2017: Up at 0630 to a beautiful Alabama morning. 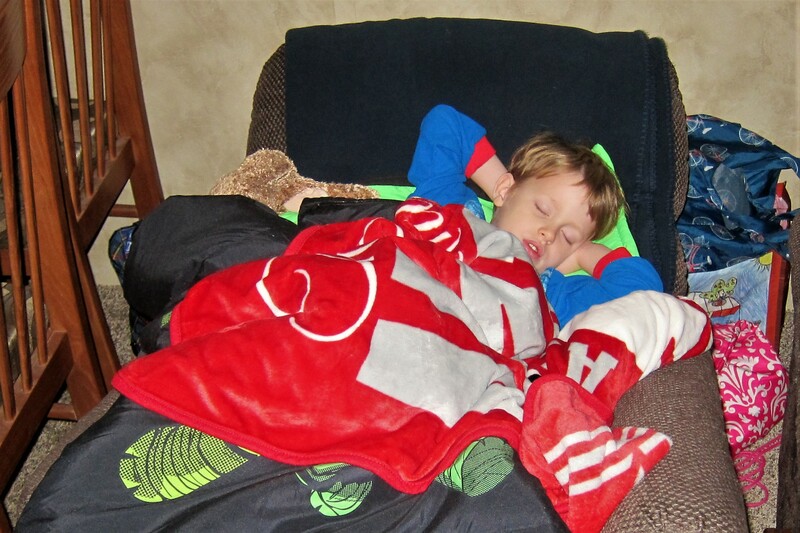 Our young camper-guest slept soundly throughout the night, much to the surprise of his grandparents. However, alas, it was time to hit the trail…thanks for everything folks! Kit and I rolled out at 0905 and headed for I-65 which we took toward the south. Quickly the weather turned threatening as dark clouds loomed and the wind velocity increased. Just as we were discussing stopping to let the squall blow over, we popped out of the weather as the clouds abated along with the wind. Ironically, the exact same thing happened last year at this point in our journey. 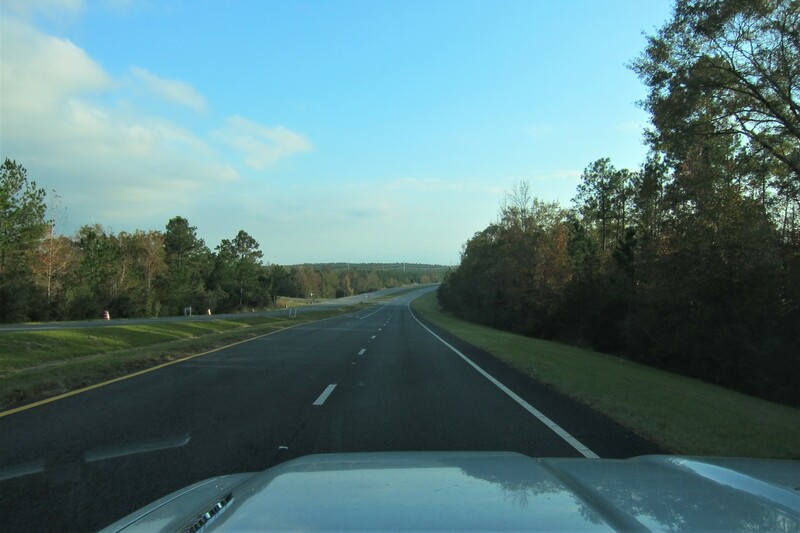 Since all was well, we motored on, crossing the Florida border at 1525 and arriving at our destination for the next few days, Pensacola on the Florida panhandle. 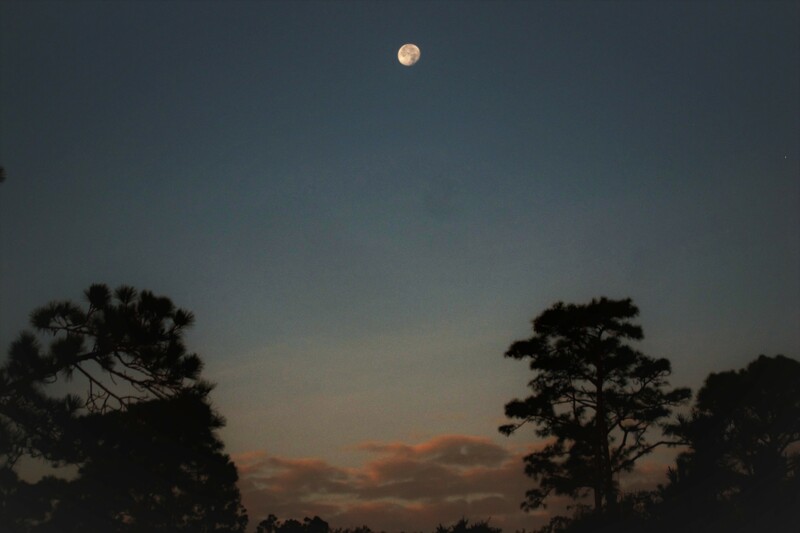 Checking into Oak Grove RV Park on the shores of Pensacola Bay, Kit and I walked to the beach as the moon was rising. Stay tuned for more Adventures of Bill and Kit coming soon to an e-mail box near you! 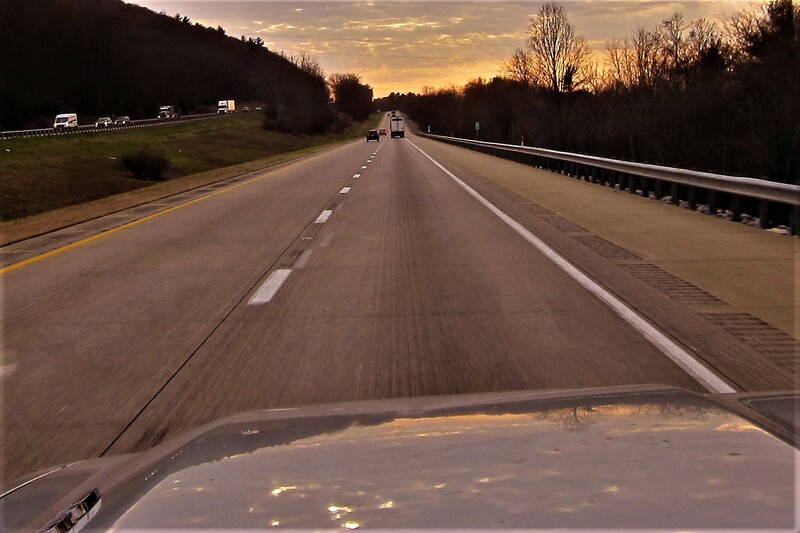 Kit’s Bits: Well, as I expected, Bill finally realized that driving 600 miles on the first day of our trips is ludicrous, at our age! So, per Bill’s decision, this will be the LAST time we do that! It was a nice treat to be able to stay in the camper the first couple of nights. Ordinarily, we stop at a hotel the first one or two nights on these trips. However, this year the weather has been milder, and we were able to locate a few campgrounds that were open. We thoroughly enjoyed our time with Sam, Debbie and Brantley. We are keeping you and your family in our thoughts and prayers. This entry was posted in 2018 Excellent Adventure. Bookmark the permalink. .hope the present adventure goes well! Sorry you missed the 6 of snow Brunswick got yesterday afternoon & evening! Have a happy. Thanks folks, however we encountered a bit of snow in Louisiana! Trip going well and still plodding west. Hope you are well and have a very Merry Christmas!! Loved the newsletter plus it was interesting to see all the previous trips. U are lucky you have such a good navigator. have fun and be safe. lots of bucketheads out there. Thanks Mickey for the nice words concerning the journal. Hope you folks have a great Christmas! This weekend, we had the second power blackout on our Brunswick street in as many months and the first snowstorm of the season. The electricity is back on (for now) and more snow is in the forecast for tomorrow. Sorry that you are missing all this fun. Paraphrase Tom Bodett, keep the lights on for us! Great to be back on the road with you. Suggestion: Since you do such a wonderful job posting your pictures and commentaries — you must be thinking of ways to further enhance your travelogue. I would like to see a mini-map of your day’s travel routes. Just a thought! That’s a great idea…I’ll see if there is an app that automatically records our GPS date. Hoping you and Denise have a Very Merry Christmas! Thanks, for the opening salvo of Tucker adventures!! You are welcome! Hope you and Jeannie have a great Christmas! Hello, great adventurous for the 10th year! I admire you, folks, who love to drive to see amazing places. The photos speak for themselves. Happy Holidays and be safe! Hi, great to hear from you…hope all is going well and that you have a Merry Christmas! Great to see a blog post ! Thanks. Oh, and this adult kid still enjoys the annual two part dis-harmony happy birthday song despite the audible moans haha. Happy 10th year on the road! Thanks Joe, love you guys! Welcome back to the road!!! You guys got of out Dodge just in the nick of time! I like your presumably Maine wreath on the back of your RV. 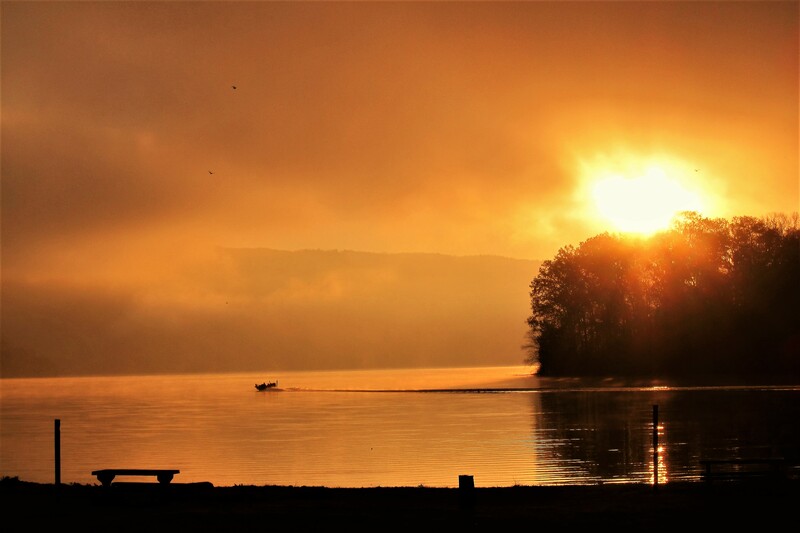 …I’ve missed your photography and you didn’t disappoint…Love the sunrise over that TN lake. I call it “Golden Pond Sunrise”! Beautiful! 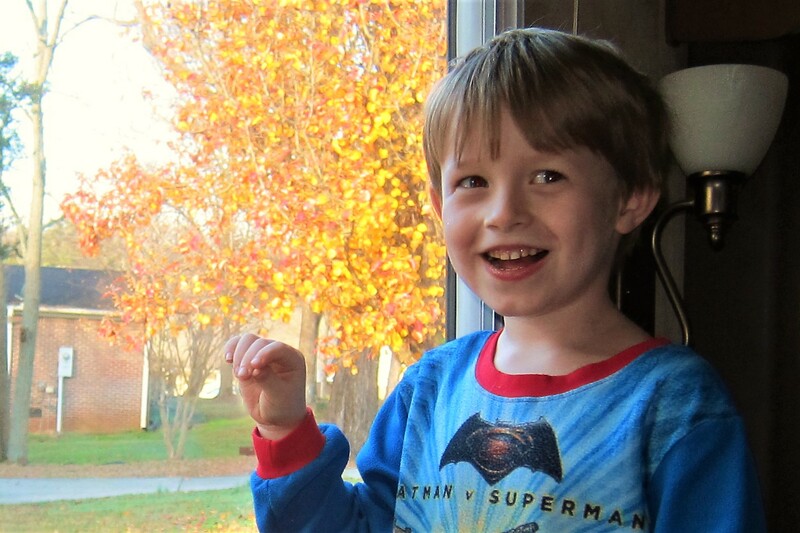 …What a tragic loss for your friend Debbie to lose her son, Justin! My thoughts and prayers are with her and the rest of her family…. 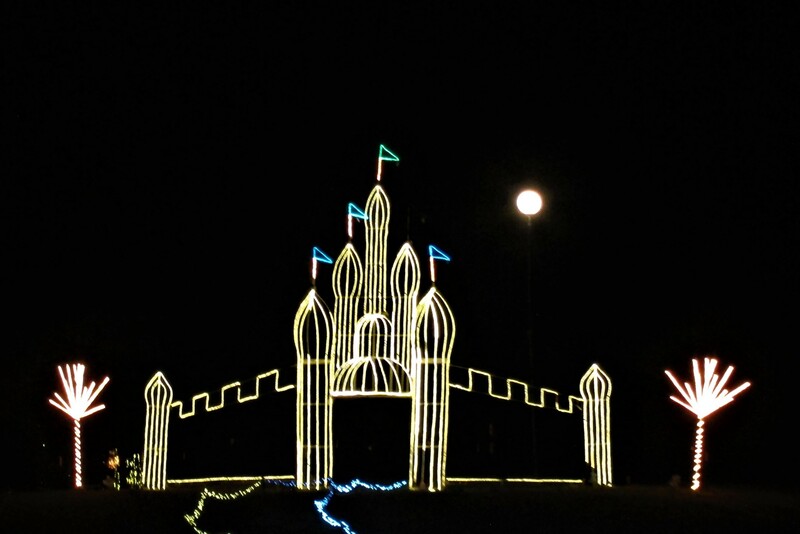 Prescott Valley, AZ, has a very similar Christmas light show display. I like the “light” version of your antique touring car that you bought this summer! What a coincidence …they must have known you were coming! …Great start to your trip! I thought you’ve been doing this longer than 10 years!…. Drive safe! Thanks Nancy, for your nice comments. That wreath is indeed Maine Made by none other than Susie R. Take care and have a very Merry Christmas. It was down to 3 degrees last night. Hi Al, great to hear from you! If the weather gets too bad, just uncover that “escape machine” and join us in the Southwest! Hope you and Stephanie have a very Merry Christmas! THANKS FOR TAKING US ALONG!! THE SIGN ON THE ALABAMA BORDER TOOK ME BACK TO MY SERVICE DAYS WHEN STATIONED AT FT BENNING GA 1955. WE OFTEN MADE A SHORT TRIP OVER TO PHENIX CITY(SIN CITY) ALABAMA TO THE SOHO DANCE HALL. WELL ONE NIGHT AS I RETURNED TO BASE, I WAS PULLED OVER FOR DRIFTING ACROSS THE YELLOW LINE. SORRY TO SAY, HAD AN OPEN BOTTLE OF VODKA ON THE BACK SEAT FLOOR.AND THIS UNDER ALABAMA LAW WAS GROUNDS FOR ISSUING ME A DUI CITATION. I SPENT THE WEEKEND IN THE SLAMMER AS I WAS UNABLE TO POST THE 100 DOLLAR BOND. SUB NOTE. SEGRATION WAS ALIVE AND WELL DOWN SOUTH IN THOSE DAYS. MY BLACK FRIENDS WERE PROHIBITED FROM EVEN EATING IN MY CAR AT THE DRIVE IN RESTAURANT. THANKS FOR THE EDUCATION ON COTTON. BEING I DIDN’T PAY ATTENTION DURING THAT SUBJECT IN GRADE SCHOOL, I FAILED THE TEST!! A CHILLY 8 DEGREES HERE IN EAST BOWDOINHAM, ME.THIS MORNING. WE HAVE HAD ABOUT 6 INCHES OF SNOW THUS FAR. THANKS FOR THOSE MOONLIT INTERLUDES!! GODS SPEED AND BE SAFE! 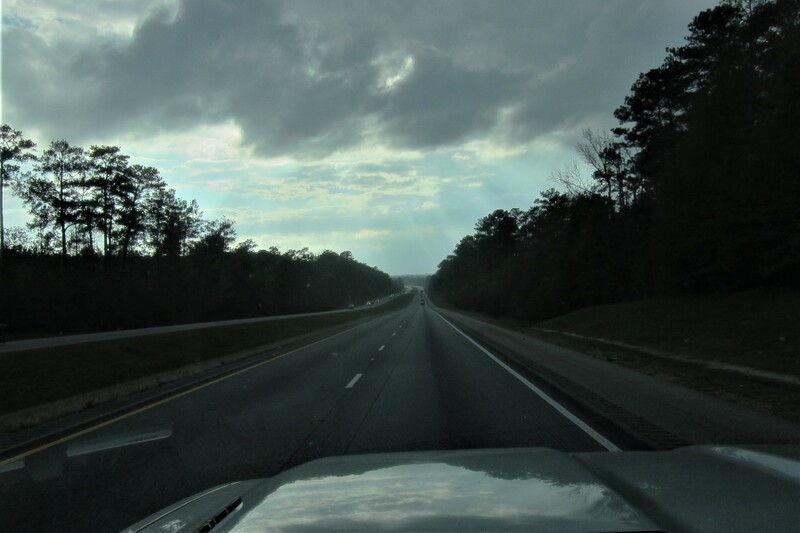 Thanks Chet for the comment and for sharing your memories of life in the south! Take care of yourselves and stay well!